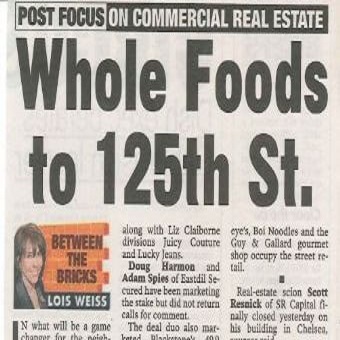 The organic grocery chain also signed to open on the corner of 87th Street and Third Avenue. In Harlem, the grocer will fill 39,000 square feet on the ground and lower levels of a new project being developed by retail maestro Jeff Sutton. The ground floor asking rent was $180 per square foot. The Post reported the deal on its website yesterday. Burlington Coat Factory will open in 70,000 square feet on the top three floors, and we predicted in June the wholesome behemoth would also land there. Jacqueline Klinger and Chase Welles of SCG Retail repped the food giant on both deals. Sutton repped his Wharton Properties for his upcoming five-story building that will have the potential for a residence or hotel above. Stay tuned for a mid-2015 opening. The Third Avenue site was repped by Gary Alterman of RKF and will open in mid-2014.